When we wrote about what happens when you install the top ten apps from CNET Downloads, about half of the comments were from people saying, “Well you should download from a trusted source.” The only problem is that there isn’t a freeware download site that is free of crapware or adware. And here’s the result of our investigation to prove it. We were unable to find a single freeware download site that isn’t listing bundleware awfulness, and while a few of them attempt to do the right thing and alert you when something is bundled, it’s just not good enough. Nobody reads the fine print, just like nobody reads the installers when they are clicking through. And some of these installers are extremely tricky. They move the buttons around. They change the text or, in some cases, they make it look exactly like a terms and conditions screen. They hijack browsers, insert ads, and they even use hidden services with deep dark API functions. 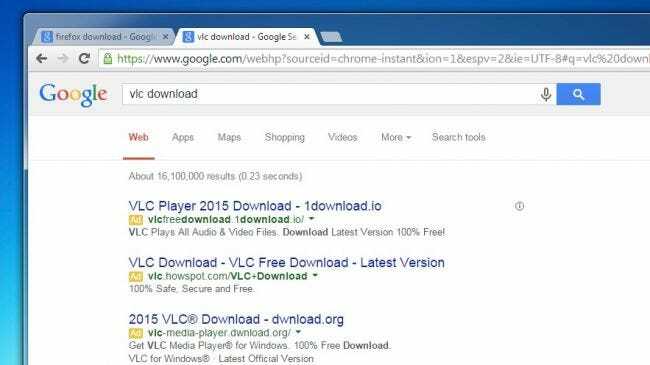 The latest trend is pushing lookalike copies of Google Chrome with adware bundled directly into them. We’re just going to go through the list of all the top sites and illustrate all of the crappy adware awfulness that is being bundled. Because the fact is that everybody is doing it to some extent by providing downloads that include this nonsense — the worst offenders are adding their own install wrapper to make sure that you get punished. Note that we aren’t talking about Ninite (which we do recommend) in this article because that isn’t so much a download site as it is a service to install software while skipping the crapware. Freeware isn’t actually free software, and we’re all paying for it now. It’s not unlike Idiocracy. Ow! My balls! We don’t really need to include this since we already covered what happens when you download from them, but hey, it was a fun trip through the mire of awfulness. They still remain the kings of bundled nonsense. We hear they might challenge John Edward and Justin Bieber next year for the biggest douche in the universe award. If we click that button, the rest of the dominoes should fall like a house of cards. Checkmate. This site is an abomination and should be removed from the Internet. 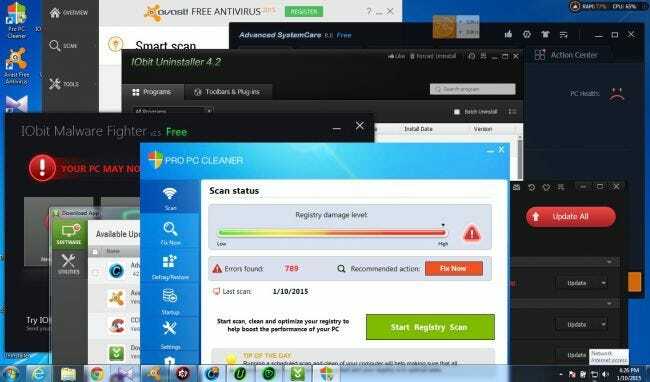 It’s actually probably worse than Download.com – almost everything in their top downloads list is a scammy fake scareware application that screams about your PC being broken even though it’s a fresh install. And then they are wrapping their awful crapware wrapper on top of it, which hijacks your browser, injects ads everywhere, and installs even more crapware. Somebody should be ashamed. Maybe Download.com will have some competition for that award after all. Ask.com us no more questions, because you are full of lies. I forget how that rhyme goes. Sure enough, the first thing we downloaded off FileHippo included bundled nonsense and the awful Ask toolbar, and then the next screen tried to install some Search App, and the next one a weather checker, and the next one tried to install the same scammy fake registry cleaner that Download.com tried to stick us with. That’s four pieces of crapware for the price of one! Why couldn’t they just stick us with the horrible Trovi adware and get it over with? The really annoying thing with this particular one is that on every screen, they changed the order of the buttons and what they said, so you not only had to really read carefully and uncheck things, but you had to do something different on each page. Remember that Chuck Norris movie, Delta Force? We should watch that again. We had a bunch of people tell us that Softpedia is a good place to download stuff from. 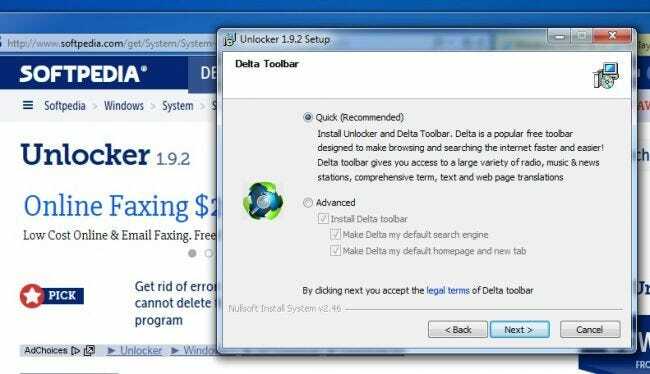 So we clicked on a link for Unlocker from their homepage, and immediately we were told that the Delta Toolbar is popular and it makes browsing and searching faster and easier! Boy are we missing out on something. To be fair, wayyyy down at the bottom of the page they do tell you that it’s ad supported and that you should be careful. Because we all like to read every single word on a page before clicking to download that app that we really wanted. Oh, so this page is copyrighted for 2015? Good to know. All rights reserved? Now we can safely close the tab. Users are advised to just use Linux and get it over with. Weirdly that Delta toolbar failed to install, even though we tried to. Which is a pity, because I wanted to see how terrible it is. To be fair, anybody that downloads Orbit Downloader kinda deserves it. We were pleasantly surprised that SnapFiles puts a notice higher up on the page — once you click to download the application — but just like the rest, there are loads of crapware bundling apps to be had. 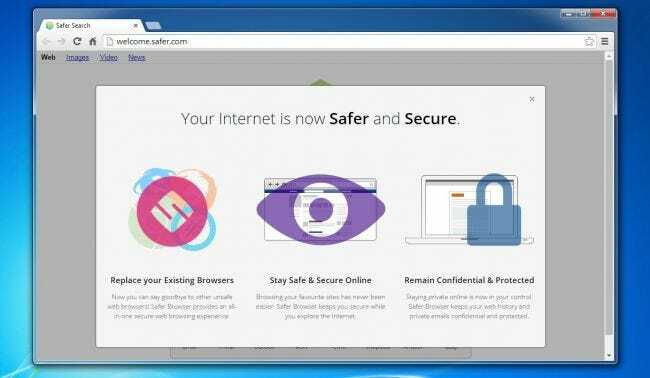 This one installed all sorts of stuff, but the kicker was a Chrome lookalike called “Safer Browser” that is literally a version of Chrome that isn’t actually Chrome and forces your homepage and search to Yahoo. Anybody that forces you to use the lousy Yahoo search is basically peddling malware. We feel so Safer and Securer. We’ve got this warm feeling… from our computer melting. 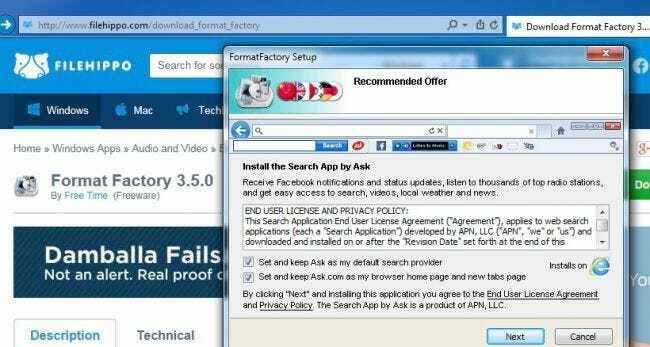 We’ve noticed that the latest trend is creating fake versions of Chrome with adware being bundled with them. We tried to install it but it just kept buffering. This site is weird because they don’t really provide downloads, they just link to the direct download links on other sites. So they have no way of ensuring quality at all, because that site could just replace the files with crapware installers. The other problem is that half the downloads don’t have any installer… it’s just a .JAR file or a .XPI file or something. So while they aren’t providing crapware on every single thing, they also aren’t really very user friendly either. There was another really awful crapware offer after this one. 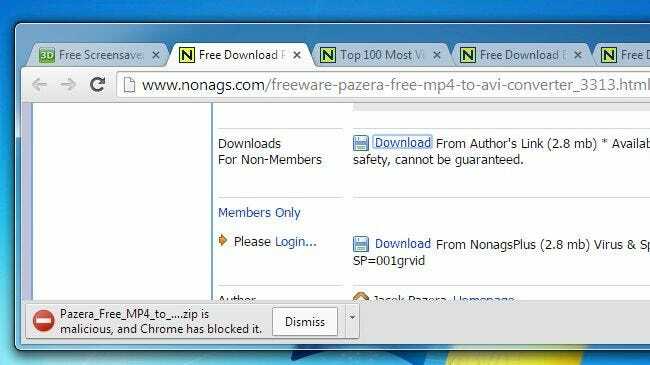 NoNags is a software download site that goes to great lengths to provide spyware and adware-free downloads… for their paying members. For everybody else, you have to click a link to download from the original website, which will often be replaced with crapware bundling nonsense. We’ll have to commend these guys, because as we were browsing around we noticed that they actually took down a lot of the download links for stuff that has gone to the dark side. But it didn’t take very long to find something that is bundling crapware. Google Chrome blocked the adware download. In unrelated news, this malware redirects your browser to Bing. So if you want to pay for a membership, you can get some freeware that has been checked for spyware. Or you could just spend money on quality paid software and help a programmer pay his bills. Their download buttons say “Trusted for open source”. I don’t think it means what they think it means. Like everybody else, SourceForge has now joined the dark side, and they are providing downloads with bundled nonsense under a program they call DevShare. Thankfully it is opt-in so the project owners must agree to do it, and we can be even more thankful that not everybody has done so, but based on what we’ve seen elsewhere, it’s only a matter of time. 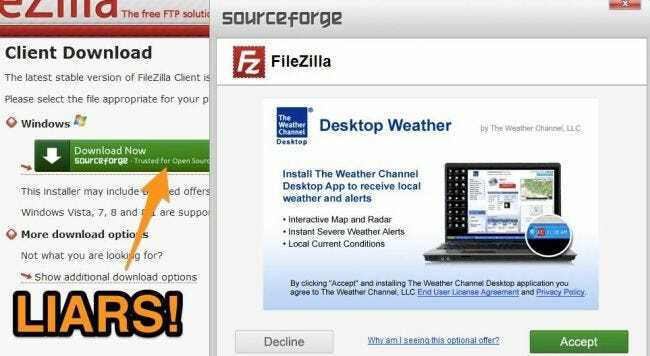 The people behind FileZilla don’t have the open source spirit, apparently, because they decided to opt in to crapware ads. They also claim to filter through the offers and only offer non-malware, but based on what we’ve seen, the definition of malware is a gray area. The bundle installer also weirdly accesses all of your browser cookies from all of your installed browsers. We’re not sure what’s up with that. Maybe somebody with some hacker skills can figure out what is going on here. So if you see “Installer Enabled” on a SourceForge download, it means you are about to be punished for something. Note that the screenshot in the first picture was taken a while ago and the at the time of writing of this article, the installer didn’t have any current offers to show, although we’re wondering if that’s because we are running in a virtual machine. We’ll keep testing. 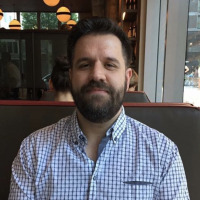 We had more geeks write in defending MajorGeeks as a trusted source than any other site, so we were really hoping that they would be the one site that doesn’t allow any bundled crapware. Sadly, that’s not the case. The first thing we downloaded — some stupid screensaver — included four pieces of really terrible crapware, including two that had adware like ShopperPro and BoBrowser that just take over your system. It’s worth noting that if you know where to look, MajorGeeks does actually tell you which items contain bundled crapware, as they put the license as Bundleware for those terrible items. They also have a notice in red text in the description of the item that it contains adware, although just like Softpedia, it’s too far down on the page. Now if they would just make that warning in 40 point red font we’d be happier. We actually talked to the owner of MajorGeeks about this, and he said that if he only listed freeware downloads that don’t contain bundled crapware, he’d have almost no downloads to list and would just have to close up shop. So he makes sure to mark things as containing bundled crapware, and there’s a notice at the bottom. We wish the notice was bigger, and more prominent, but we’ll have to give him credit for at least trying to do the right thing. And for testing every single thing that they put on the site before they put it up there. You Should Download from the Official Site! One of the most common responses to our article was that people should just download from the official site. And as everybody knows, you use Google to find anything. The ironic thing is that most of these downloads are hijacking your browser… away from Google. Sadly, even on Google all the top results for most open source and freeware are just ads for really terrible sites that are bundling crapware, adware, and malware on top of the installer. Most geeks will know that they shouldn’t click on the ads, but obviously enough people are clicking those ads for them to be able to afford to pay the high per-click prices for Google AdWords. 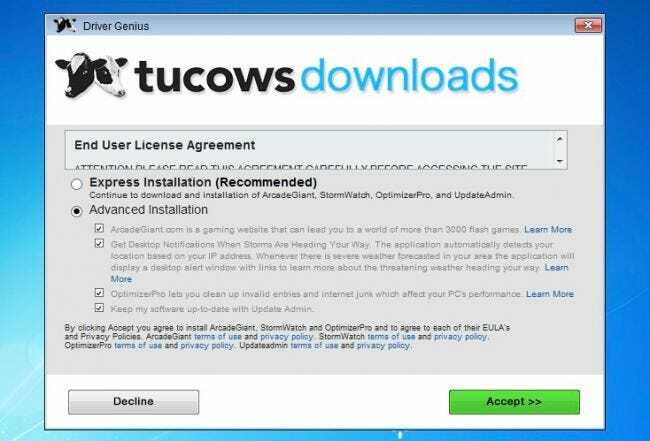 So if you absolutely must download some stupid freeware from somewhere, you may as well punch yourself in the face. And then either find the real site (ignoring the ads) or use Ninite or test it out in a virtual machine first. Or consider just buying software from a programmer that deserves the money. Or maybe switch to OS X or Linux. Because like we told you last time, when the product is free the real product is YOU.